Five years after the release of their sophomore album Collab, LabField, one of the leading lights of the European improv scene make a welcome return. Their genre-melting third album Bucket of Songs, was recently released on Hubro Music. Bucket Of Songs marks the start of a new era for LabField. Not only have they changed direction musically, but a new member has joined the band. It’s exciting times for LabField. The LabField story began when Swedish guitarist, David Stackenäs, met Norwegian percussionist Ingar Zach. Both were experienced musicians, and among the leading lights of the European improvisational scene. Previously, Swedish guitarist David Stackenäs has played with a number of bands. Since 2002, David has been a member of numerous bands. This includes Agape, Boots Brown, Fire! Orchestra, Hot Four, Pipeline, Seval, SURD, The Christer Bothén Trio, Territory Band and Tri-Dim. Each of these bands have one thing in common, they produce groundbreaking music. That’s the same with the various bands Ingar Zach has been a member of. Just like David, Norwegian percussionist Ingar Zach has an illustrious musical pedigree. Previously, Ingar has been a member of Batagraf, Dans Les Arbres, Huntsville, LOOPer, Mural, Muta, No Spaghetti Edition, the Magnetic North Orchestra and the Trondheim Jazz Orchestra. However, it was when Ingar was a a member of Tri-Dim, that he played alongside David Stackenäs, his future partner in LabField. Tri-Dim released their one and only album 2 Of 2 in 2002. 2 Of 2 was billed as a collaboration between Tri-Dim, Jim O’Rourke and Barry Guy. It was well received upon its release. However, it proved to be the only album Tri-Dim released. Eventually, Tri-Dim ran its course. While saxophonist went Håkon Kornstad his own way, David and Ingar decided to form a duo. This duo became LabField. Their musical manifesto was to create music that was radical and groundbreaking. However, before that, Ingar and David had a lot of music to make. Apart from playing in various bands, Ingar has also played alongside some of the biggest names in the Norwegian improv scene. This includes Arve Henriksen and Erik Honoré. When they’re looking for a percussionist, it’s Ingar’s number they dial. So, given how busy Ingar and David have been, it’s no surprise that LabField have only released three albums since 2008. It was in 2008, that LabField released their debut album Fishforms on the Bottrop-Boy label. On its release, Fishforms was well received by critics. Fishforms was hailed an ambitious and groundbreaking albums. Critics and cultural commentators forecast great things for LabField. They were right. Two years later, LabField returned with their sophomore album Collab. It featured guest appearances from Ståle Storløkken and Milanese guitarist and composer, Giuseppe Ielasi. He featured on Crucial, and is credited with taking charge of “electronics.” However, Giuseppe had played an important part in Collab’s success. When critics and cultural commentators heard Collab, they recognised that this was a career defining album. It transformed LabField’s career and fortunes. Suddenly, they were rubbing shoulders with the great and good of Norwegian music. Despite the critical acclaim that accompanied Collab, it’s taken LabField five years to release their third album, Bucket Of Songs. However, the songs had been recorded over a three year period, by LabField’s new lineup. Recording of Bucket Of Songs took place in various locations in Europe. The first session took place in Stockholm in October 2009. By then, LabField were a trio. Guitarist and electronics virtuoso Giuseppe Ielasi had joined LabField on a full-time basis. The Milan born musician was the perfect fit for LabField. He was an experienced musician. Before joining LabField, Giuseppe Ielasi has released numerous solo albums, including several for the 12K label. Giuseppe has also collaborated with a number of artists, including Taku Sugimoto, Jerome Noetinger, Phill Niblock and Oren Ambarchi. When he’s not busy recording, Giuseppe finds time to run his own label, School Map. However in 2009, Giuseppe Ielasi became LabField’s third man. Following the initial recording sessions in Stockholm, it wasn’t until March 2011, that LabField returned to the studio. This time, the location was Madrid. Nearly two years passed before a further session took place in Madrid, in January 2013. Gradually, Bucket Of Songs was taking shape. The last recording session took place in July 2013. That’s when Mariam Wallentin of Wildbirds and Peacdrums, Mariam The Believer and the Fire! Orchestra added her distinctive vocals. Once Mariam added her vocals, all that was left was for Bucket Of Songs to be mastered. Giuseppe Ielasi mastered Bucket Of Songs in Milan. He had been involved in Bucket Of Songs since March 2009. He plays on the album, and with the other two members of LabField, produced Bucket Of Songs. It was released recently to widespread critical. You’ll realise why, when I tell you about Bucket Of Songs. Ragged Line Reversed opens Bucket Of Songs. The arrangement jitters, becoming jagged and dramatic. Soon, the arrangement drones, as washes of powerful music assail you. LabField are at their inventive best, improvising, and feeding off each other, taking their music in a new direction. Previously, LabField focused on lengthy, detailed and multi-textured soundscapes. A feature was long, slow, flowing drones. While that’s still present, the soundscapes are shorter, with more focus on improvisation. Here, LabField combine avant-garde, drone, experimental and industrial music, as they reinvent their music. One thing that hasn’t changed, is that still, LabField are musical pioneers. Page 55 continues the reinvention of LabField. The tempo is slow, a scrabbled guitar, rustling drums and chimes ringing out. Sometimes, a cymbal crashes. Then Mariam Wallentin delivers a jazz-tinged vocal that’s variously breathy, whispery and urgent. She even adds harmonies, as the arrangement meanders ominously along, its heartbeat pulsating as the soundscape reaches a crescendo. The tempo increases on Temporary Reasons. A crystalline guitar plays, before a myriad of percussion joins. David Stackenäs’ guitar playing seems to have been influenced by world music. Listen carefully and there’s a Latin influence. Ingar Zach’s percussion is urgent and dramatic. He plays with a sense of urgency. Somehow, David manages to keep up, matching Ingar all the way. In doing so, they create a track that’s dramatic, urgent and mesmeric. As Bucket Of Songs unfolds, guitar is slowly strummed thoughtfully. Soon, what sounds like Morse Code interjects. This gives the soundscape a cinematic sound. Occasionally, a guitar is strummed. Still the beep, beep, beep of the Morse Code sends out its signal. By now, percussion punctuates the arrangement. Bells ring out. Briefly, feedback cackles and crackles. Then a synth creates a buzzing sound. It sweeps and soars above the arrangement. It’s like a plane looking for somewhere to land. With the addition of what sounds like Morse Code, this conjures up pictures of night-time sorties over enemy territory. This is Boys Own stuff from LabField, purveyors of cinematic music par excellence. A plucked string plays opens Intensive Course In Bad Manners. It contributes to the understated backdrop. However, soon, a wash of droning music enters. Machine gun synths are unleashed. Still, the plucked chiming string can be heard. By now, it’s almost been overpowered as this droning soundscape reaches its crescendo. Is it bells or a clock that chime on The Boy Who Never Remembered To Forget? Whichever it is, it contributes towards an eerie cinematic soundscape. Especially when the thunderous, rumbling sound combines with a detuned guitar and chiming clocks. It’s creates an eerie, ominous sound. The result is what sounds like the soundtrack to a 21st Century, improv remake of the soundtrack to Alfred Hicthcock’s The Birds. Thunderous drums pound, a cymbal crashes and a harpsichord plays as Straight A’s In Constant Sorrow shows its secrets. Meanwhile, a buzzing sound underpins the arrangement. As the elegiac, crystalline guitar plays slowly, adding a wistful sound, drums and cymbals are pounded and punished. Still, the buzzing sound adds a sci-fi sound. Later, the guitar is strummed with a sense of purpose. Despite its lack of volume, it’s still at the heart of the arrangement where beauty, drama and raw power sit side-by-side. Quite simply, this is improvisational music at its most ambitious and innovative. Just an acoustic guitar and Mariam Wallentin’s tender, thoughtful vocal combine on Members Crossed. Mariam delivers her vocal slowly, as if ruminating over lyrics. When she pauses, so does the guitar. This is highly effective. Gradually, though, the arrangement builds. Washes of feedback shriek, but are tamed. As percussion is added Mariam improvises. Her vocal becomes an instrument, as she scats. Later, her vocal becomes veers between powerful to ethereal. By then, LabField are pushing musical boundaries to their limits. They’re at their most adventurous, fusing avant-garde, experimental, free jazz, improv, industrial and rock during this sonic adventure. Last Passacaglia closes Bucket Of Songs. A guitar is strummed, reverberating into the distance. It’s accompanied by jittery, persistent percussion and Mariam Wallentin’s elegiac vocal. It soars above the arrangement. Just at that moment, a roll of drums and crashing cymbals interject. They add drama and urgency. So does Mariam’s powerhouse of a vocal and David’s guitar. LabField it seems, are feeding off each other as they improvise. In doing so, they ensure that Bucket Of Songs finishes on a resounding high. Five years after LabField’s critically acclaimed sophomore album Collab, they make a welcome return with Bucket Of Songs, which was recently released by Hubro Music. It’s a career defining album from LabField, who are now a trio. After featuring on Collab, Giuseppe Ielasi now joins LabField on a full-time basis. His addition comes at a time when LabField’s music was undergoing a change. On Collab, LabField’s previous album, it featured just two soundscapes. Cebollon was a thirty-six minute epic, and Crucial, which featured Giuseppe Ielasi, lasted nearly eight minutes. Both tracks were full of detail and multi-textured. The two slow, flowing drones captured the imagination of critics, cultural commentators and music lovers. However, LabField felt it was time for a change. So between March 2009, and July 2013, LabField recorded nine soundscapes. They’re much shorter. The shortest soundscape lasts just three minutes, the longest, just over six minutes. These nine soundscapes allow LabField to stretch their legs musically, and mix things up. 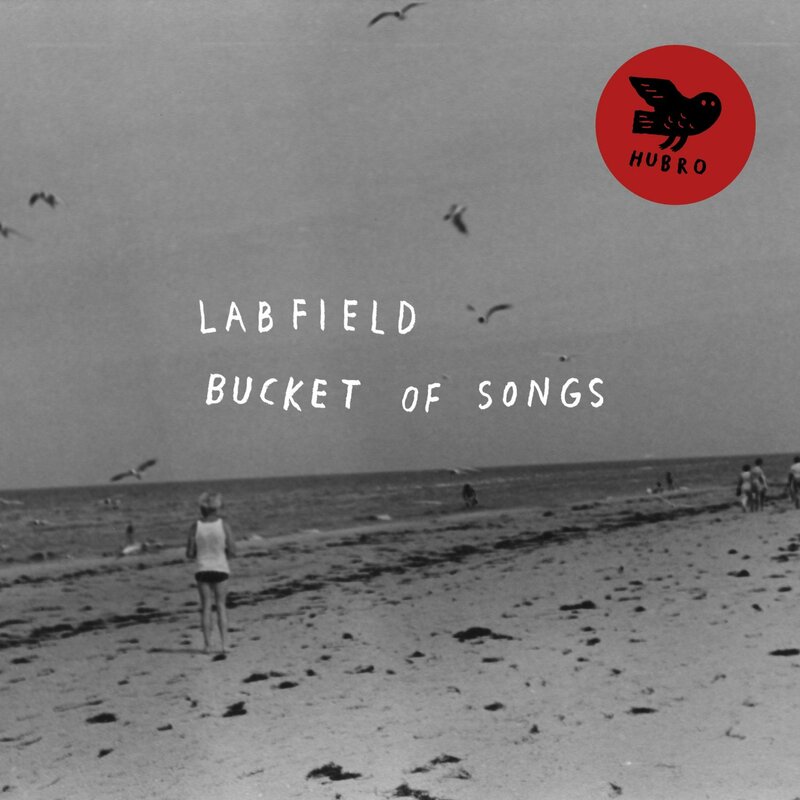 Over the nine songs on Bucket Of Songs, LabField combine elements of ambient, avant-garde, electronica, experimental, free jazz, industrial, Latin, post rock, pop, rock and world music. However, at the heart of Bucket Of Songs’ sound and success, is LabField’s trademark brand of improvisational music. As LabField improvise, they visit a variety of disparate musical genres. Somehow, though, this fusion of all these disparate musical genres hangs together, and make perfect sense. It seems seamlessly, LabField have the ability to feed of each other, taking the music in a new and unexpected directions. That’s why you should never, ever, try and second guess LabField. That would be impossible. That’s why the best way to describe LabField is musical mavericks. Their ability to manipulate sound sees the three sonic explorers take their listeners on a magical musical mystery tour. They take you places that other groups can only dream of. In doing so, LabField create music that’s variously ambitious, challenging, cinematic, dramatic, inventive, innovative minimalist and urgent. It’s also music that’s guaranteed to make you think. Sometimes, the music on Bucket Of Sounds sets your mind racing. Don’t fight it, enjoy the ride. LabField will take you to places you’ve never been before. It’s just a case of letting your imagination run riot. If you do, LabField will richly reward you, as you experience Bucket Of Songs’ nine captivating and groundbreaking soundscapes. ← TOUCHING THE VOID-LOVE, LONGING AND LOSS.